NASA's Cassini Orbiter captured a breath-taking view of Saturn impossible to see from anywhere else. Using it's wide-angle camera, with the violet filter, the spacecraft snapped this incredible image on Oct. 28, 2016. NASA's Cassini spacecraft is known for some of the most extraordinary images of Saturn, and its rings and moons, that we have seen. 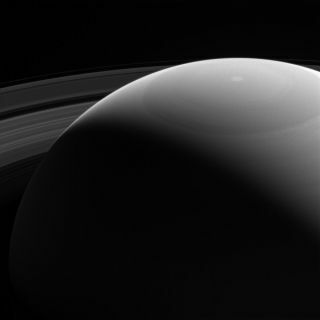 And this view over Saturn's "shoulder" is no exception.